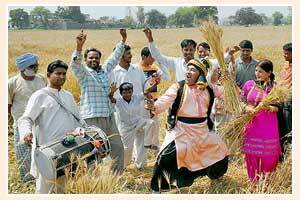 Baisakhi is an ancient harvest festival which is celebrated in Punjab with lot of enthusiasm and fervor. It marks the beginning of new harvest season. It is celebrated in North India, particularly in Punjab, when the Rabi crop is ready for harvesting. It generally falls on April 13th or April 14th every year. Baisakhi has a special meaning for the Sikhs. On this day in 1699, the tenth Guru, Guru Gobind Singh organized the order of the Khalsa. Devotees gather in the gurdwaras and offer their prayers to the almighty. On this occasion, men and women wear bright colored clothes and traditional jewellery. They express their happiness by dancing on the Bhangra and the Giddha tunes. This festival is full of fun and frolic and brings in happiness and joy. At many places people fly kites to enjoy the occasion.